Typically noise within a baseboard system can come from two different sources. The first and most common way that noise will become evident within your heating system is an introduction of unwanted air within the piping. This will make a noise like a river flowing, or a babbling brook outside the window. However peacefull this may be, it becomes annoying and also robs you of valuable efficiency ratings. Basically that noise of water running by, is costing you money. This type of heating system is a closed loop system and should be full of only water at a constant pressure. When a leak occurs, air can get introduced into the system. In order to alleviate this type of problem, a repair must be performed to eliminate the source of the air and then the system must be completely purged. Another way that air can be introduced to the system is through a faulty diaphragm within the expansion tank. This is a small tank that is installed to specifically absorb the thermal expansion that is created within a boiler and the piping as the water is heated. This tank is charged on one side of a rubber diaphragm with a preset amount of air. The other half of the tank is connected to the system and fills with water. The expansion compresses the air charge and the liquid pressure within the system can maintain a constant pressure. When these tanks blow their diaphragm the pre charge of air gets introduced into the piping and the system will start to sound like a rushing river. Replace the tank and then purge the system and the repair is complete. Once the air has been removed from the piping the noise will be eliminated as well and your system should operate in a nice quiet fashion. The second type of noise that will be heard with this type of heat is a pinging or even a banging noise as the heat comes on. Small pings can be caused because the expanding elements are moving on their brackets. This just pings a little. Just enough to be annoying. This can be solved by sliding a small piece of cardboard under the element at each hanger. Do not use plastic as it will smell after time. The louder banging noises are usually caused by a restricted pipe. Somewhere there is a pipe up against the side of the whole it comes through and when the expansion that takes place from heating the water occurs, the pipe expands against the tight hole or beam and makes a loud bang as it heats up. The fix for this type of noise problem can be a little harder as the pipe in question and where it's restricted will have to be located and the problem solved by mechanically enlarging the hole or re routing the pipe. Once the restricted pipes are free, the noise will be gone and your peace and quiet, as well as peace of mind will return. Hot water heating should run completely silent when it is properly installed and purged. If your system is making noise then you need to get the air out or un-restrict the piping. These are pretty much the only things that will make noise in your system. If your heating sounds like a river in the Amazon, you'll need this reference guide to help purge the air from the boiler and lines. 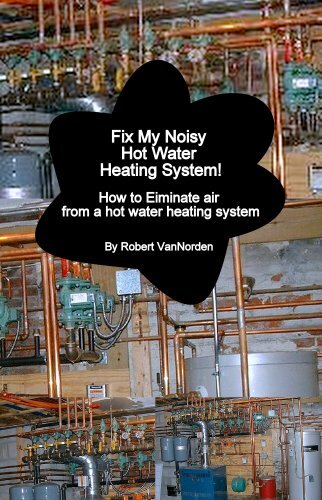 A well written easy to follow guide for purging a hot water heating system to eliminate unwanted air. Need More Information On Hot Water Heating Systems? From boilers to thermostats learn what it all does. 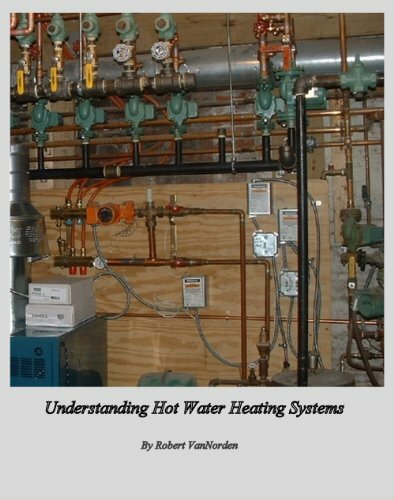 This e-book will walk you through the hot water heating system. It covers all components, their job, and the series of operation that keeps you and your family warm.